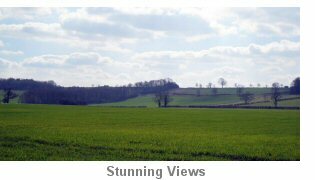 The full figure of eight walk is a little under 10 miles, and takes in three delightful villages and some glorious countryside. 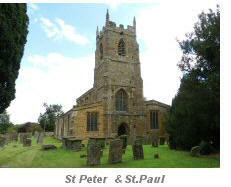 Enjoy undulating country, quaint villages and welcoming village pub. The terrain is mostly flat with only a few inclines and easy stiles. For the shorter walk follow directions to the crossing point at C then skip to H. During the first half of each walk you will enjoy a delightful section of the Millennium Way the route being clearly marked by the distinctive black waymarkers. Find out more about the walk by clicking on the information icon. 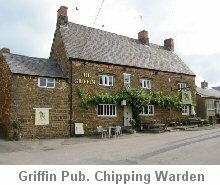 Facing The Griffin pub in Chipping Warden go right to find parking area. Just opposite, follow the clearly marked Millennium Way footpath sign on the right and cross field diagonally to far left corner stile. Cross stile and then go L with hedge left for approx 200 yards to reach way mark post. Turn right on bridleway to go down middle of field, to pass just to left of lone tree, to find hidden river at bottom of field. Go with river right ignoring bridge right and pass wood to come to gate right. Take gate and go ½ right up field to find gate. Take gate and go with woods right to exit by two gated gaps. Go ahead between wire fences through first field, continue with hedge left in second field to find mid field stile. Take stile and go ½ right down field to cross further stile and bridge over stream. Take stile immediately after bridge into field then go ½ right over rise and stay ahead with poplar trees right to exit by five bar gate. Continue with fence right to find mid fence gate. Take gate and go ½ left towards series of gates. Ignore gates and take stile to right side of gates to reach lane. Turn right down lane over stone bridge to T-junction. Go left on road round right hand bend and at left hand bend go straight ahead through hedge gap to field. A roadside information board here provides some useful information on the Battle of Edgcote in 1469. Go with hedge right to eventually pass a number of dilapidated vehicles. Continue ahead with hedge right following bridleway. Maintain this direction through fields you will notice hedge changes to left after a time and after ½ mile look out for a bridleway track coming in from the right (Point C). There is a way post here with multiple way makers. For the shorter walk back to Chipping Warden we leave the Millennium Way by turning right at the way post with the multiple way markers and follow directions from H below. To complete the full walk continue forward past the way post with multiple way markers for 80 paces to reach a gap on the left. Ignore gap and continue ahead along the track on the Millennium Way with hedge left maintaining the same line and ignoring gaps and vehicle swings. Continue, across gallop, ignoring gap and go forward to end of hedge left to take large metal gate into next field. Maintain line to go to left of finger of trees to come to corner gate. Take gate over disused railway line and exit by gate, ahead left. Go up hill to brow, walking between two wooden posts, and then ahead keeping trees and hedge left to exit field by top left field gate by cattle grid. Turn left on farm track walking away from the farmhouse continuing along rough surfaced track until you reach the crossroads. Go through gate keeping well to the right of stone brick cow shed, and continue up field to waymarked wooden stile next to metal gate. Go over stile and continue ahead with hedge left to go through a five bar gate continuing with hedge left. Where the hedge curves to the right, take waymarked gap L (partially hidden) through hedge into next field heading towards corner of wood just to the right of two brick/stone barns, then continue along path with wood right. Maintain line ahead into field keeping hedge right and soon after hedge curves left take waymarked gap (hidden) right continuing same line ahead with hedge and wire fence right. Go past farm buildings on left to take stile to road. Turn right on road into village of Culworth. Thirty yards before T-junction look out for bridleway sign pointing left. Take bridleway now (or you may wish to visit the village or Red Lion pub to return to this point later) to go past Barn Hill and Orchard House. Continue ahead where bridleway narrows to become a rough track. Go ahead past two metal gates k eeping stone wall to your right. Descend gently with hedge right to go under metal railway bridge then through gates and over stream to a gently rising path in the next field keeping trees right. Stay ahead through field corner gap maintaining same line with hedge and trees right. The footpath ahead emerges from a small gap in corner of field to reveal a beautiful view ahead where we continue our downward path in a staright line to a mid hedge gap in the hedge at the far side of the field, then go through the gap. 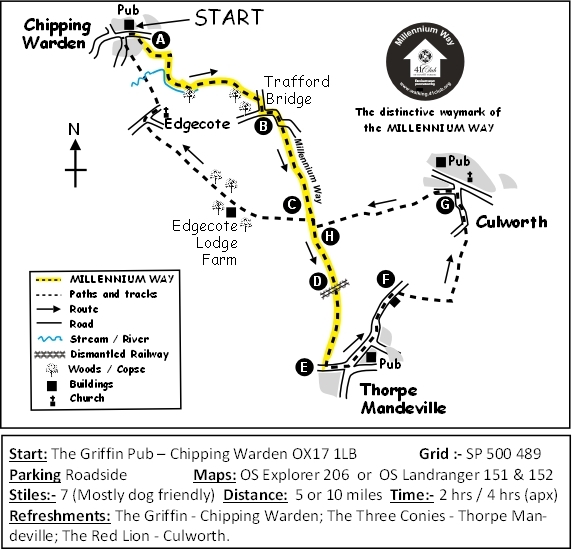 (If you are walking the the Thorpe Mandeville / Culworth loop turn left and follow the route instructions from Point C ) For walkers returning to Chipping Warden go through gap and turn immediately right and you are now back on the Millennium Way. Continue down track with hedge right to find the field post with multiple way markers which you passed at Point C. On reaching this way post with the multiple waymarks turn left going gently uphill with hedge right. Keep to right edge of field, walking gently uphill, with hedge right eventually descending to find waymarker at field corner, then cross stream through narrow gap into next field. Follow waymarker across next field towards trees. Continue on a rising path with hedge and wood left. When you reach farm buildings turn right to pass in front of farm and continue downhill on paved track eventually passing small pond on left. Follow track until sharp bend right at a Y junction with triangular shaped rock on left. At this point leave track and maintain line straight ahead across field aiming for L edge of wood ahead. (This footpath is often not well demarcated). When you reach left edge of would continue on same line to cross corner of field towards plastic fenced gallop ahead. Go across plastic fenced gallop (watch out for racehorses) into next field to maintain same line. On reaching the corner wooden gate go ½ left diagonally across corner of field to exit by gap just to the left of large green metal gate to lane. Cross over lane then go right to walk past three triangular stones and a posting box on the left, set in a brick structure. 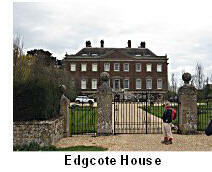 Continue down the surfaced track heading towards church then passing a large mansion (Edgcote House). Immediately past the house take track L to pass through green metal kissing gate. Continue down track between beech hedges passing through gateway, and continuing gently downhill. Cross bridge over the River Cherwell and stay on rising track. (Keep an eye out on your R for a silver plaque mounted on a concrete plinth which marks the site where a Wellington Bomber which crashed in 1945) Stay on cinder path gently uphill. Keep ahead on track through woodland then exit through metal gate next to lodge (dated 1846) on the left. Here you will see an information board, which is of interest. Stay ahead with cottages on L to enter the village of Chipping Warden., passing the ancient church of St Peter and St Paul. Continue with stone wall on right then turn right down Culworth Road which brings you back to The Griffin for some well earned refreshment. This village was an important market town. The name "Chipping" is derived from the Old English cēping meaning "market". In 1238 Robert Grosseteste, Bishop of Lincoln obtained royal letters from Henry III revoking Chipping Warden's right to hold a market. This was because the Bishops of Lincoln controlled the market at Banbury and earned tolls from it, and Grosseteste feared that Chipping Warden was drawing trade away from Banbury. The largely Gothic church of St.Peter and St. Paul contains tiered box-pews. The north wall of the chancel contains two blocked-up Norman arches that suggest the building may date from about 1200. At Trafford bridge we cross the Cherwell which feeds the lake of Edgcote House. The house, built in 1747, and its magnificent estate between Wardington and Chipping Warden were used as the backdrop to the 1995 Pride and Prejudice TV drama starring Colin Firth. 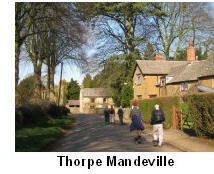 The Village may have originated as a Danish settlement - Thorpe is an Old Norse name for a village. 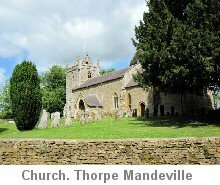 (Mandeville is a corruption of Amundeville – Richard de Amundeville was lord of the manor during the thirteenth century). 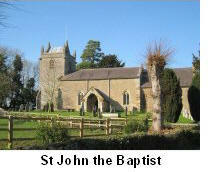 The church of John the Baptist contains 14th and 15th century wall paintings. The churchyard contains a huge yew tree, reckoned to be more than 1000 years old. The Danvers family held the manor of Culworth from 1643, when Samuel Danvers (1611–1683) was created a baronet. The Danvers Baronetcy became extinct with the death of Sir Michael Danvers, 5th Baronet, in 1776. Marble monuments to the Danvers family inside the church of St. Mary the Virgin were erected in 1790. The school dates back to 1789 when Merial D’Anvers, the spinster daughter of a local prominent land-owning family, commissioned the building of the original school house which is still in use today. Culworth Forge on the Green operated for over 500 years before closing a few years ago, to be replaced by Forge2, a gallery exhibiting the work of local artists.